Prepare to be seduced and get addicted to one of our most popular games! 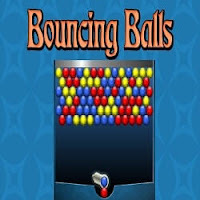 In the arcade classic of Bouncing Balls, your goal is to form groups of 3 or more balls of the same color so that they can be destroyed. When the game starts, multiple rows of color balls will slowly move downward from the top. A color ball is placed inside the launcher at the bottom of the play area, while the next ball will also be displayed. Move your mouse to change the direction of the launcher, then click to launch the ball. If the ball forms a group of at least 3 balls of the same color, the whole group of balls will be destroyed. When the balls are removed, the pieces which are only attached to the destroyed group of balls will also be eliminated, for example, when you have destroyed a group of blue balls, the red balls which are only attached to the blue balls will also be removed. Your score is recorded at the top left corner of the screen. If you can destroy a larger pile of balls, more points will be awarded. 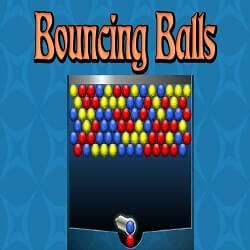 If the balls reach the bottom of the play area, the game ends. Clear the field so as to proceed and rocket up the leaderboard. This game is part of Action Games. 1. Test Your Brain-Smart Questions For Smart People: It contains the different Picture Puzzles to test your brain IQ. 2. Matchstick Math Brain Teasers for Teens with Answers: It contains the simple algebra equations with matchsticks where your challenge is to move exactly one matchstick and then correct the given equations. 3. Brain Teaser Riddles for interviews with answers: It contains very interesting and confusing brain teasers which are asked in the interviews of many technology companies like Google, Microsoft, Facebook etc. 4. Can you find the hidden faces in Pictures? : These are the brain teasers to test your observation skills in which your challenge is to find the hidden faces in the puzzle pictures.